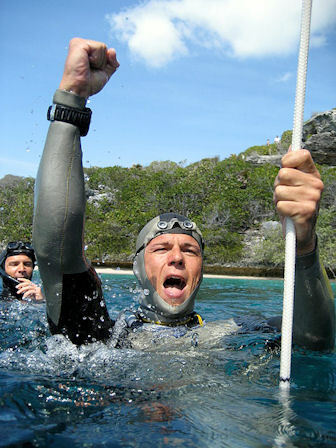 Who is Herbert Nitsch, and how did he earn the title “Deepest Man on Earth”? Well, Herbert is the free diving world’s phenom and the newest representative for Breitling’s Superocean watch. He is the perfect choice for the job, given the fact that he has acquired 31 world records in free diving. The Breitling Superocean has traveled that road to the bottom of the sea and back to dry land…but the story doesn’t end there. Herbert is an extreme pilot, as well, achieving world record status in both arenas. Nitsch is also known as “The Flying Fish”, as he is the only human to free dive to the incredible depths of 700 feet, on a single, deep breath, as well as being a pilot, who takes his plane to intense heights. It seems appropriate that Breitling would join forces with this amazing individual. Breitling has equipped Nitsch with the perfect performance watch for his adventures, the Breitling Superocean. This precision instrument has accompanied Nitsch on his previous dives, and will be his partner on his next endeavor…an attempt to reach his ultimate goal of free diving to the celebrated 1000 foot mark. The Breitling Superocean will be on his wrist when he meets that challenge!